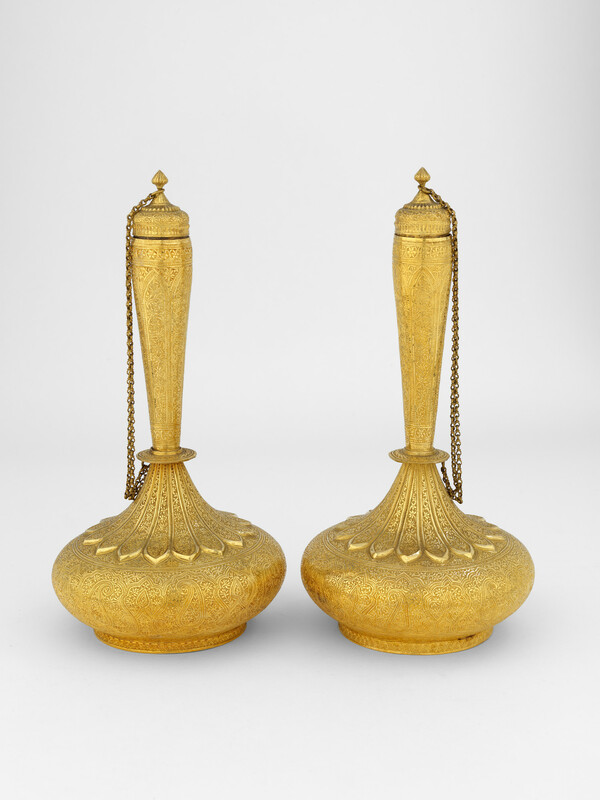 A pair of gold bottles or surahi engraved with stylised flowers and overhanging cypress trees. In the late 19th century this patterning was described as 'shawl' patterning in reference to the Kashmir-produced shawls, woven and embroidered with similar motifs. The use of gold indicates that this was a special commission by the Maharaja of Kashmir. Silver versions of bottles of this form and decoration are found in a number of collections and were popular amongst European collectors. As a result of this demand, the Birmingham-based firm Elkington and Co. produced several Kashmiri-style objects in both silver and electroplate.